Nintendo's R.O.B. might have been a really crappy peripheral, but without it we wouldn't have Rock Band or Guitar Hero - we might not even have Nintendo, or gaming as we know it at all. Twenty-five years ago, the world of gaming looked very different than it does today, and I don't just mean in regards to graphical capability. The oversaturation of the market with crappy games led to the Videogame Crash of '83, and retailers refused to stock any further games or consoles, believing they had been just a fad. It was an incredibly hostile economic climate facing Nintendo when the Japanese game maker tried to bring its successful Famicom (aka the NES) to the States. To circumvent the anti-gaming climate, Nintendo tried a different tactic, as related by Sam Machkovech in Issue 225 of The Escapist: It packaged the NES with a little robot called R.O.B., and marketed the console as a toy - a risky gamble, to be sure. But R.O.B. was perhaps riskier than all of those business moves, because his face was, for all intents and purposes, the company's face for a short while. R.O.B. had an intense '80s-perfect look, and he dominated Nintendo's earliest advertisements, the ones that eventually won over America's anxious toy retailers. So if the plucky little robot bombed - if little kids couldn't stand playing with Nintendo's most iconic product - then wouldn't the console's American debut have bombed right along with him? What would have happened if R.O.B had been a flop, and the NES consequently a bust? Can we imagine a world of gaming today without the influences of that generation - or the ones to follow? Thankfully, we don't have to. To read the full story of how R.O.B. 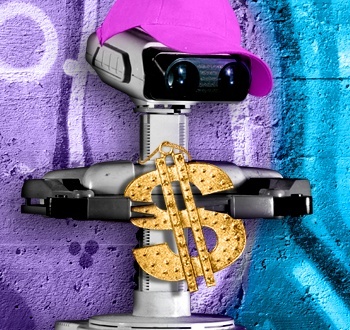 paved the way for Nintendo and the modern peripheral-based game, read "Notorious R.O.B." by Sam Machkovech in Issue 225 of The Escapist.